I’m still trying to come to terms with the fact that Thanksgiving is NEXT WEEK. I mean, what?!? So not ready. We’ve had some health issues arise in the family this year so I’m trying to be more health conscious with my recipes, Thanksgiving dinner included. 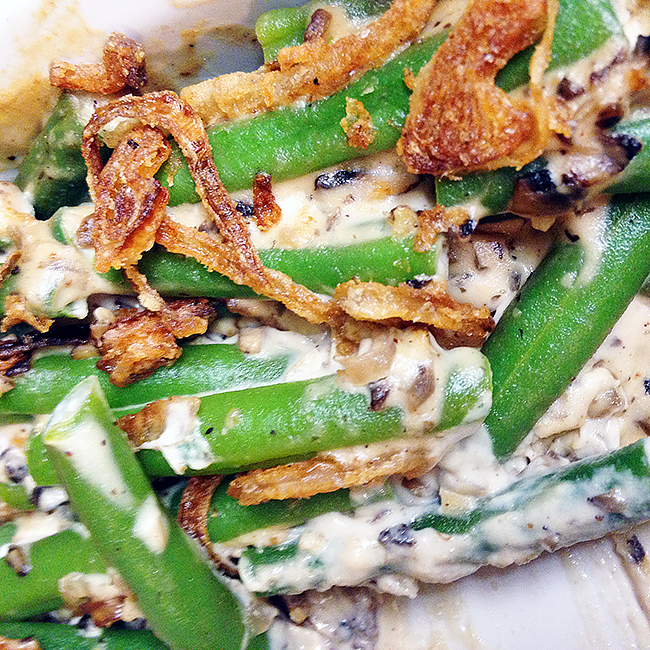 Luckily, while this green bean casserole is on the healthy side– no canned soup, all fresh ingredients, all made from scratch– it’s still amazingly delicious. 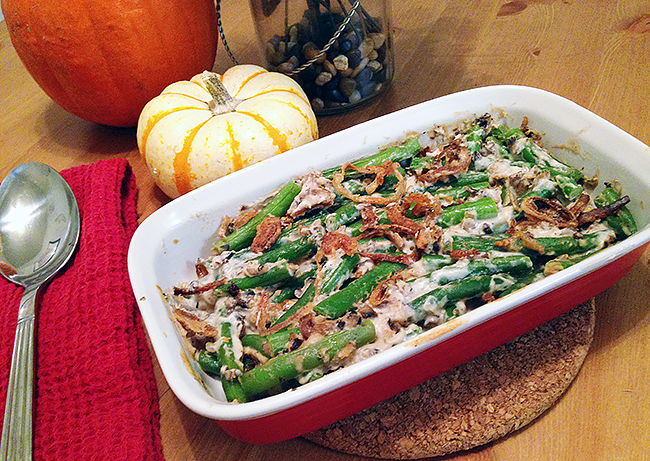 Can you imagine Thanksgiving without green bean casserole? Just no. Not only is this recipe guilt-free, it’s vegan as well. If you have vegan friends/family coming for dinner, you will totally rock their world with this recipe! To make the cashew cream, put cashews in a container and cover with water; cover container with lid. Allow the cashews to soak overnight, or at least 4 hours to soften. Blend the softened cashews with the almond milk in blender until totally smooth. In a bowl, whisk together the flour, cayenne pepper, garlic powder, sea salt and ground black pepper. Add the sliced shallot rings and toss to evenly coat with flour mixture. Coat pan in olive oil and heat. Fry the shallots in batches until light, golden brown and crispy– don’t let them go too dark as they will brown more in the over on top of the casserole. Preheat oven to 350° F. Fill large saucepan with water and bring to a bowl and add green beans. Cook for about 5 minutes until tender (I tend to go longer as we prefer them softer). Drain and add to cold water to stop the cooking process. In a large skillet, coat pan with olive oil and heat over medium. Add mushrooms, stirring regularly, and cook until softened. Add chopped shallots and garlic, continuously stirring for about 2-3 minutes. Add the nutmeg, soy sauce, white wine and season with salt and pepper. Allow to simmer to about 5 minutes. Next, stir in the cashew milk, half of the fried shallots, then add the green beans and fold into mushroom cream mixture. Transfer to a baking dish, spreading the green beans out evenly. Top with the remaining fried shallots and bake at 350° F for 20-30 minutes. Serve and enjoy!